The designations and denominations employed and the presentation of the material in this article do not imply the expression of any opinion whatsoever on the part of the OIE concerning the legal status of any country, territory, city or area or of its authorities, or concerning the delimitation of its frontiers and boundaries. The views expressed in this article are solely the responsibility of the author(s). The mention of specific companies or products of manufacturers, whether or not these have been patented, does not imply that these have been endorsed or recommended by the OIE in preference to others of a similar nature that are not mentioned. Georgia is located in the Trans-Caucasus region, where more than 30% of the land is mountainous. The method of livestock farming used is almost exclusively the extensive system. Backyard farms typically have three to five head of large ruminants or up to 300 small ruminants. The majority of the country’s sheep population are the native Georgian breed ‘Tushuri’, which is characterised by its disease resistance, adaptability to local mountainous conditions and excellent flavour. The rest of the population consists principally of ‘Imeruli’, also a native breed, which is smaller and less fatty. The Imeruli breed appears in the Greek myth of the Golden Fleece. Many farmers in Georgia keep large numbers of livestock and undertake seasonal movements over long distances to make optimal use of pastures. This migration is an important feature of their traditional culture and economic livelihood. About 70% of small ruminants (i.e. 700,000 head) and about 10% of large ruminants (i.e. 100,000 head) migrate to seasonal pastures. There are two historical destinations for migration in Georgia: some herds/flocks migrate to summer pastures in the Greater Caucasus to the north, while others move to the Lesser Caucasus in the south-west (Fig. 1). Spring migration begins in the middle of April and lasts until mid-June. Autumn migration begins in the second half of September and lasts until the end of November. Animals travel from 150 to 300 kilometres along these migration routes over 10 to 20 days. The average flock/herd is supervised by five to six shepherds. Animal husbandry and, in particular, sheep farming has been intensifying in Georgia over recent years, due to an increase in export capacity, bringing in good incomes for animal owners. The Government of Georgia supports the development of the animal husbandry sector with free vaccination against major transboundary animal diseases, financed by the state. Diseases endemic for the Trans-Caucasus region, such as foot and mouth disease, lumpy skin disease, peste des petits ruminants, sheep pox and goat pox, Crimean–Congo haemorrhagic fever, piroplasmosis, babesiosis and theileriosis, etc., threaten the development of the animal production sector. These diseases could easily enter or spread throughout Georgia due to seasonal animal migration. To prevent vector-borne diseases, animal owners used to treat their sheep in home-made dipping pools but biosafety practices were poor. Furthermore, loose adherence to acaricide instructions resulted in inadequate treatment and environmental pollution (Fig. 2). Controls over animal movement, including seasonal migration, fall within the responsibility of the national Veterinary Services of the National Food Agency (NFA). 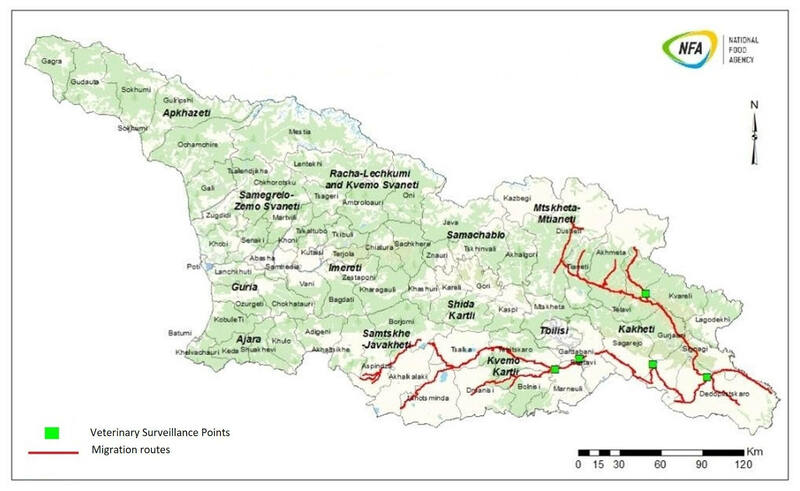 Therefore, with state budget support, the Alliances Caucasus Programme (ALCP) has built a series of Veterinary Surveillance Points (VSPs) along the animal migration routes. These VSPs – now known as Biosecurity Points – were made possible by funding from the Swiss Agency for Development and Cooperation (SDC), and implemented by MercyCorps Georgia. to treat animals against vectors to reduce the negative effects of external parasites. The overarching purpose is to increase the productivity of livestock and their export potential. The locations of these VSPs were selected in consultation with relevant stakeholders, including the Shepherds Association of Georgia, animal husbandry experts and local municipalities. Five VSPs currently operate along the migration routes with one additional VSP yet to be established. A VSP is a concreted, iron-fenced facility, consisting of two separate areas; one for large ruminants and one for small. 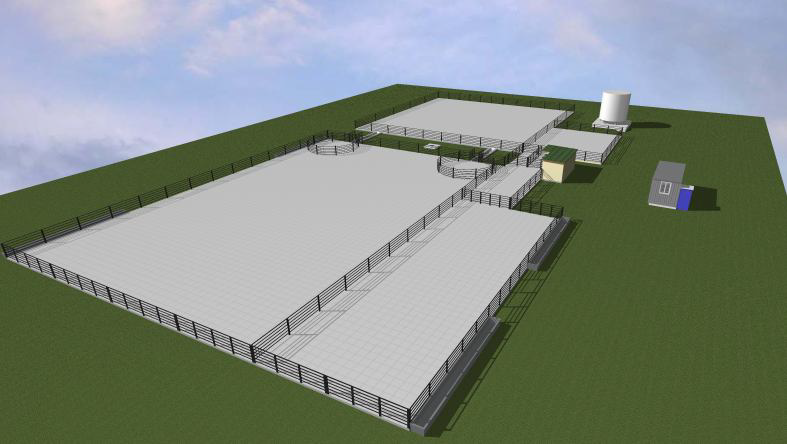 Both have isolated animal-holding pens, animal treatment zones and animal-resting areas (Fig. 3). VSPs function seasonally, during the period of animal migration. Small ruminants are treated by dipping them in a pool where they swim freely and are soaked in an acaricide, while large ruminants are herded through narrow thoroughfares where they are showered (Figs 4 and 5). instructing animal owners on treatment procedures and safety precautions. confirming that their animals have undergone treatment with their signature. Acaricides can cause soil and ground-water pollution. To avoid this, special attention is paid to waste disposal. 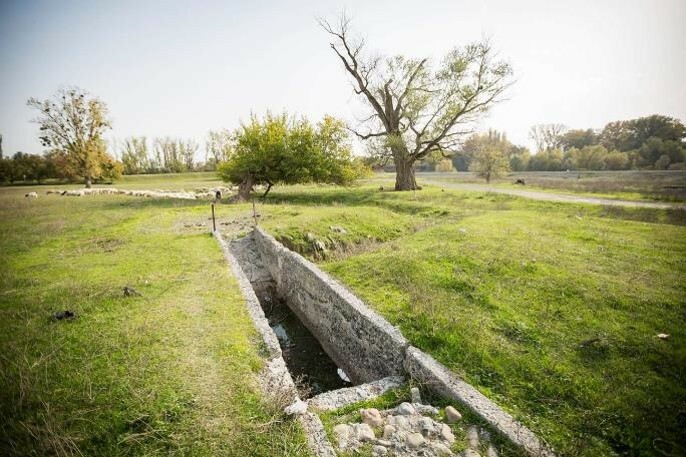 After the acaricide solution has been used, it is poured into fluid-collecting tanks (septic pools) and later pumped out and managed by a contracted company, in full compliance with the environmental protection laws of Georgia. Veterinary Surveillance Points represent a potential opportunity to increase the efficiency of state Veterinary Services, enabling them to make targeted inspections and control risk conditions at specific locations in a cost-effective manner. In the future, it is planned that VSPs will have additional functions, such as vaccination, sampling, and animal identification. These VSPs would also help to ensure that animal owners take part in knowledge, attitude and practice (KAP) surveys and participatory surveillance.